Although a medical writing is an integral cog in the wheel of drug development process, traditionally, a medical writer (MW) was considered to be an outsider, providing support activities and coordinating with the stakeholders. However, changing dynamics in the current scenario suggests that a MW needs to be actively involved in all stages of drug development process, especially in the development of publication plan in collaboration with all contributing stakeholders, for example, clinicians, statisticians, preclinical and translational scientists, health outcomes specialists, and medical affairs representatives. As per the International Committee of Medical Journal Editors (ICMJE) criteria, the authors are accountable for the content of the publications bearing their name. However, the authors who generally are key opinion leaders (KOLs) in a particular therapeutic area may have limited time or knowledge of publication ethics and reporting guidelines. In that scenario, a MW can liaise between the cross-functional teams and help research sponsors to publish their data in a simple and lucid language, ensuring that the MWs involvement and funding source and all contributors are listed, and all listed authors meet applicable authorship criteria. Published online on August 11, 2015, in the Annals of Internal Medicine, good publication practice guideline 3 (GPP3) is deemed to play an important role in preventing inaccurate, incomplete, delayed, or misleading reporting of research. As per the guideline, the quality of publications lies solely on the MW who needs to ensure reduced risk for retractions due to misconduct. Importantly, the GPP3 guideline also emphasizes on the listing of MW as an author if they qualify for an authorship (that is, as described by the ICMJE or as specified in journal). If required, a MW may also be delegated responsibility of completing administrative task related with submitting the presentation to the congress or publication to the journal. The MW needs to avoid plagiarism and take responsibility to present the findings accurately, clearly, and without any intent of confusing the readers. A joint statement issued by American Medical Writers Association–European Medical Writers Association–International Society for Medical Publication Professionals (ISMPP) on the role of MW echoed the similar thoughts, where the statement emphasizes the need to follow GPP3, ICMJE, CONSORT, and other applicable guidelines, while assisting company-sponsored research, in association with external authors. Over the years, GPP has evolved from first describing the standards for sponsor-based publications, to further bring integrity and transparency in nonacademic publications. [Figure 1] demonstrates salient features of all the three GPP versions,, that have been published so far. One of the key salient features of the GPP3 is “Reporting and publication processes should follow reporting guidelines and applicable laws, such as those of the International Committee of Medical Journal Editors (ICMJE recommendations.” Along with recommendations “we recommend,” the guideline is now more assertive about what investigators, writers, and companies “should,” or sometimes even “must,” do. In this way, the guideline in conjunction with other publication guidelines will improve the quality of research for future health care. There are now two main guidelines that the MW, reviewer, and editor should be proficient and always have in hand: ICMJE and GPP3 guidelines. 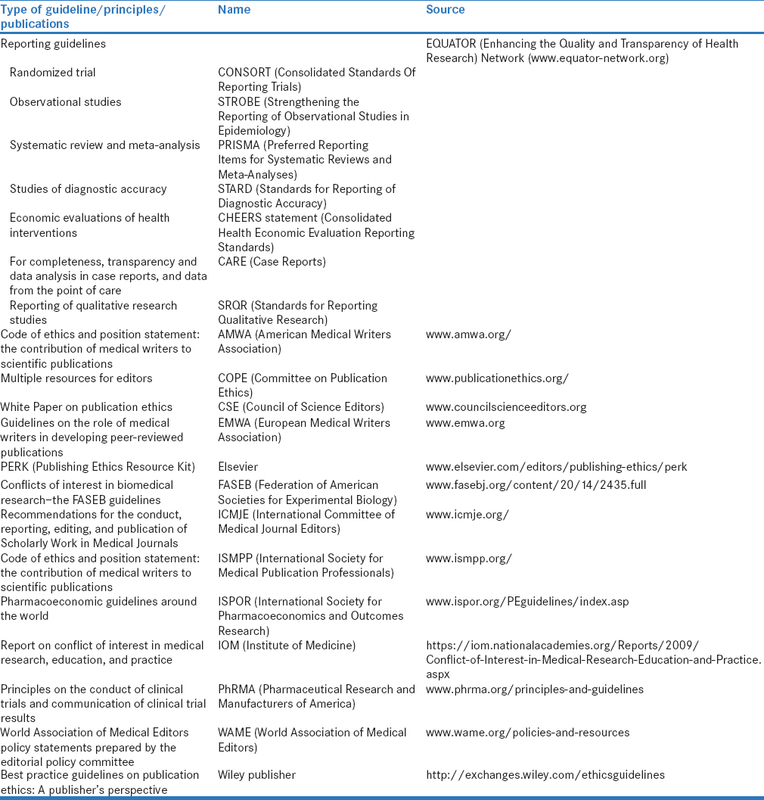 [Table 1] provides the list of some of the other existing guidelines in the publication and related domains. In addition to technical expertise with respect to publication ethics and guidelines, the MW should undergo training program provided by organizations such as ISMPP, European Medical Writers Association, Drug Information Association, and American Medical Writers Association), and certification programs with enforceable codes of conduct (American Medical Writers Association certification Website, www.amwa.org/certification, ISMPP certification Website, www.ismpp.org/certification). Although the trainings are not mandated currently, these may be recommended or required in the future by some journals or organizations with evolutions of GPP guidelines. After the enactment of the US Sunshine Act, which was focused on the reporting of fees received and transfers of value, public perceptions of investigators' and physicians' attitudes toward publications developed with companies have been affected. Remuneration for assistance in publication planning could be mistaken as paying for authorship rather as funding to support writing assistance. This may lead to confusion among authors and reluctance by the KOLs/physicians to be involved as authors or co-authors, especially whose home institutions have policies to distance their faculty from pharmaceutical and device manufacturers., This is because it is in strike contrast with the GPP3 recommendations on reimbursement. The current GPP guideline has clarified separately regarding the reimbursement to authors (for example, travel and accommodation and pay for publication activities such as writing, editing, data interpretation, or similar services). All the reimbursements made should be as per the applicable regulations and at par with the market value. Thus, we need to have more definitive guidance from the Centers for Medicare and Medicaid Services and more transparency. If we go by GPP3 recommendations, KOLs would only be benefited from their publication record and may choose not to participate in a publication effort. This would lead to greater transparency in selecting authors for publications by pharmaceutical organizations and may lead to an end of the practice of guest authorship. The MW in that scenario would be required to communicate with the authors in an effective way to make sure all the authors contribute to each draft while adhering to stipulated timelines. The author contribution should include and satisfy all the three criteria as laid by ICMJE and not only the editorial changes to the initial draft written by the MWs. The GPP3 guideline emphasizes on full access to relevant study data including study protocol, statistical analysis plan, statistical report, clinical study report or any additional reasonable analysis, and anonymized patient-level data, to the authors. This must be done while respecting patient confidentiality. In subsequent guidelines, it is expected the MWs may also have access to such detailed information with proper agreements, and check and balance (to maintain confidentiality), to present the findings accurately, and to maintain the quality of the publication. Rapidly evolving regulations, recommendations, and journal are promulgating data sharing and posting of results. The Pharmaceutical Research and Manufacturers of America and European Federation of Pharmaceutical Industries and Associations published a member company survey on “Principles for responsible clinical trial data sharing” in 2016. It discussed about the degree of disclosing trial data to general public, sharing results with patients participating in clinical trials, and publication of clinical trial results. It was observed in the survey that majority of the member companies are adhering to the applicable processes for improving transparency in disclosing clinical trial information, thus supporting evidence-based medical practice. The EU regulation No. 536/2014 which is bound to be effective by October 2018, also mandates reporting of summary of the trial and layperson summary, however, the data need to be redacted to protect patient confidentiality. The GPP3 guideline supports such initiatives on data sharing. The MW should look upon this new avenue as redacted documents are something which are uncommon in the medical writing domain. A MW could thus play a pivotal role in assisting the pharmaceutical companies in making the data of trials and summary of the results accessible to the public, including laypersons which will help in creating awareness about the drug development process in the public domain and thus enhanced trust among the masses for pharmaceutical companies and their work ethics. The next guideline versions must also include other widely used but less controlled publications such as Health Economics and Outcomes Research reporting, qualitative research, case reports, e-learning modules, and tutorials, which have a direct impact on health-care resource allocation and decisions. Furthermore, there are demands going round to bring in the academic publications under the purview of GPP guidelines, which would further expand the role of MW in publications, wherein a MW could standardize the practices of this unorganized segment of publications. Probably, subsequent GPP update could suffice this demand. Good Publication Practice Guideline 3 and Indian Publication Industry: Where We Are Heading? In a stark contrast to the GPP evolution, a recent study has revealed the alarming rise of predatory and substandard journals in India, suggesting the sorry state of the Indian publication industry., However, the regulatory agencies in India are trying to curtail such practices. Recently, the University Grant Commission of India has released a dynamic list of recommended journals to be considered for publications. The list includes Journals covered in Web of Science, Scopus, Journals recommended by the Standing Committee on Notification on Journal and Language Committee, and Journal recommended by Universities. However, the selection criteria were not stringent and as not completely in line with the current GPP or ICMJE guidelines. In view of this, there is an urgent need for the academia and government agencies to come together to harmonize the publication practices in the country for a progressive future. The onus lies even more on the MWs working in India to align themselves with the GPP3 and ICMJE and other guidelines so that substandard journals and publications could be discouraged. The existing MW associations and other similar groups should work in creating advisories and awareness to maintain high levels of publication ethics, particularly in the Indian academic institutions, where the budding MWs learn the nuisance of writing papers. Further regulatory agencies along with representatives from academia and industry may consider establishing a guideline similar to GPP and ICMJE and thus creating standards for publication in Indian setting. The understanding of publication environment has evolved owing to advances in regulatory, medical, and journal requirements. The GPP3 guideline has been updated and kept pace with the changes, and to a larger extent defined and clarified role, reimbursements, and increased responsibility of MWs in the process. This further necessitates MW to keep updating with the current trends and undergo specific trainings from recognized organizations for enhanced knowledge and for developing a right approach. This is necessary for producing some high-quality documents and bridging the gap between the conduct and reporting of research. Battisti WP, Wager E, Baltzer L, Bridges D, Cairns A, Carswell CI et al. Good Publication Practice for Communicating Company-Sponsored Medical Research: GPP3. Ann Intern Med. 2015;163:461-4. Winchester C. AMWA-EMWA-ISMPP joint position statement on the role of professional medical writers. Med Writ 2017;26:7-8. Wager E, Field EA, Grossman L. Good publication practice for pharmaceutical companies. Curr Med Res Opin 2003;19:149-54. Graf C, Battisti WP, Bridges D, Bruce-Winkler V, Conaty JM, Ellison JM, et al. Research methods and reporting. Good publication practice for communicating company sponsored medical research: The GPP2 guidelines. BMJ 2009;339:b4330. Wager L. GPP3—Thoughts on Becoming a Guideline Grandmother. Available from: http://www.blogs.bmj.com/bmj/2015/08/26/liz-wager-gpp3-thoughts-on-becoming-a-guideline-grandmother/. [Last accessed on 2017 Dec 04]. Citrome L. The sunshine act and transfers of value: Impact on non-industry authorship. Innov Clin Neurosci 2014;11:14-6. Toroser D, DeTora L, Cairns A, Juneja R, Georgieva A, Weigel A, et al. The sunshine act and medical publications: Guidance from professional medical associations. Postgrad Med 2015;127:752-7. Pharmaceutical Research and Manufacturers of America; European Federation of Pharmaceutical Industries and Associations. Principles for Responsible Clinical Trial Data Sharing. Available from: https://www.efpia.eu/media/288603/efpia-phrma-report-on-the-2016-member-company-survey-on-the-joint-principles-for-responsible-clinical-trial-data-sharing.pdf. [Last accessed on 2018 Jan 05]. European Medicines Agency. Clinical Data Publication. Available from: http://www.ema.europa.eu/ema/?curl=pages/special_topics/general/general_content_000555.jsp. [Last accessed on 2018 Jan 13]. Veitch K. GPP3 – What is it, Why is it Necessary and What is new? Available from: http://www.journal.emwa.org/authors-and-authorship/gpp3-what-is-it-why-is-it-necessary-and-what-is-new/. [Last accessed on 2018 Mar 21]. Patwardhan B, Nagarkar S, Gadre SR, Lakhotia SC, Katoch VM, Moher D. A critical analysis of the 'UGC-approved list of journals'. Curr Sci 2018;114:1299-303. Moher D, Shamseer L, Cobey KD, Lalu MM, Galipeau J, Avey MT, et al. Stop this waste of people, animals and money. Nature 2017;549:23-5. UGC Approved List of Journals, University Grants Commission India. Available from: https://www.ugc.ac.in/journallist/. [Last accessed on 2018 Jun 22].